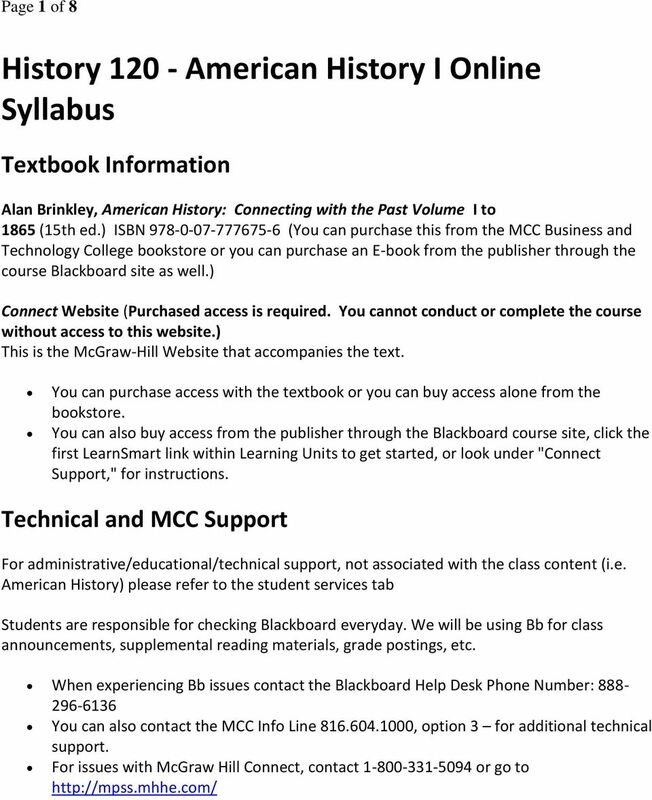 Download "History 120 - American History I Online Syllabus"
2 Page 2 of 8 Grading Assignments How Many Points Per Total LearnSmart (with McGraw Hill Connect) (final 2 worth 20) 160 Introduction Discussion Boards Unit Discussion Board, 2 Questions Per Unit, (Blackboard Discussion) 8 Questions (2 per Unit) Video Response Discussion (Blackboard Discussion) Inference Assignment ( word submitted paper) Map Assignment (with McGraw Hill Connect) quizzes (with McGraw Hill Connect) Exams (with McGraw Hill Connect) 4 (Points may vary depending on instructor modifications) 3/50-final- 100 Total points Total Point Grade Breakdown: = A = B = C = D 470 or lower = F Participation & Attendance Participation is a crucial part of this course, logging into the course does not count as attending, you must submit assignments and communicate with fellow students as well as the instructor. Attendance The Metropolitan Community Colleges attendance policy states that a student will be withdrawn from a course if they miss two consecutive weeks or onethird of the semester. 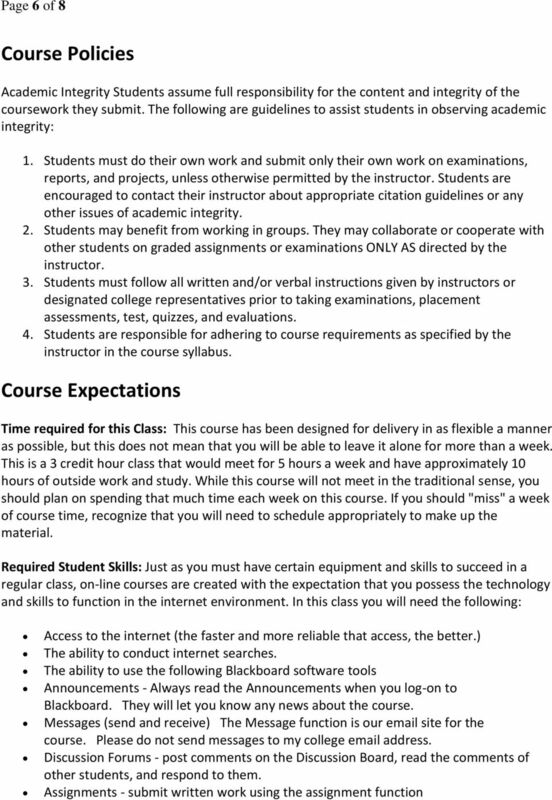 This policy will be enforced in this course, and your online activity will be monitored. Please let the instructors know, if problems arise that will affect your ability to participate in the class for any extended length of time. Attendance in online classes is determined by successful completion of assigned work. Simply visiting the website does not constitute attending the class. 3 Page 3 of 8 Late Work and Exam Policies Quizzes and Exams must be completed in the week they are assigned. No late quizzes are permitted. Make sure you know all the due dates from the schedule. Assignments and course work will not be accepted via external . 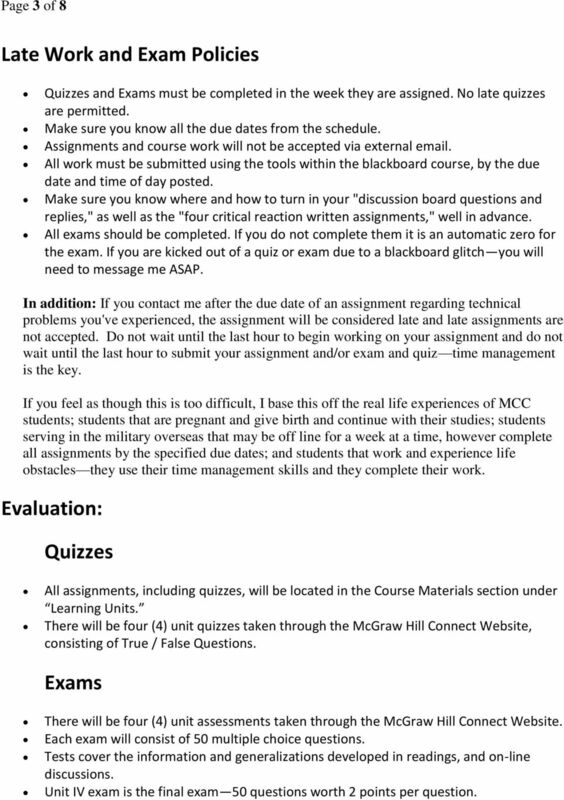 All work must be submitted using the tools within the blackboard course, by the due date and time of day posted. Make sure you know where and how to turn in your "discussion board questions and replies," as well as the "four critical reaction written assignments," well in advance. All exams should be completed. If you do not complete them it is an automatic zero for the exam. If you are kicked out of a quiz or exam due to a blackboard glitch you will need to message me ASAP. In addition: If you contact me after the due date of an assignment regarding technical problems you've experienced, the assignment will be considered late and late assignments are not accepted. Do not wait until the last hour to begin working on your assignment and do not wait until the last hour to submit your assignment and/or exam and quiz time management is the key. If you feel as though this is too difficult, I base this off the real life experiences of MCC students; students that are pregnant and give birth and continue with their studies; students serving in the military overseas that may be off line for a week at a time, however complete all assignments by the specified due dates; and students that work and experience life obstacles they use their time management skills and they complete their work. Evaluation: Quizzes All assignments, including quizzes, will be located in the Course Materials section under Learning Units. There will be four (4) unit quizzes taken through the McGraw Hill Connect Website, consisting of True / False Questions. Exams There will be four (4) unit assessments taken through the McGraw Hill Connect Website. Each exam will consist of 50 multiple choice questions. Tests cover the information and generalizations developed in readings, and on-line discussions. Unit IV exam is the final exam 50 questions worth 2 points per question. 4 Page 4 of 8 Learn Smart LearnSmart guides you through the readings and indicates what is significant. The program quizzes you periodically about the reading and directs you to the parts of the reading that may be giving you problems. These assignments are based upon the latest educational research into learning. Unit Discussion Boards, 2 Questions per Unit 1. Choose two (2) questions to answer from the list, found within each Learning Unit - (each question you select should be from a different chapter.) 2. Create a New Thread for each of your answers, in the respective discussion board forums o Write two (2) to three (3) paragraphs for a total of words of a critical analysis, interpret the information, and include what inferences do you draw from the text. o Include the question you chose from the list, at the beginning of the post. 3. You must then reply to two (2) of your fellow student s discussion board posts. (1 per Question) o Your reply to another student, should be 4 to 5 sentences. o Keep in mind these are short answer questions, however a two or three sentence response does not provide an adequate analysis of the other students work. 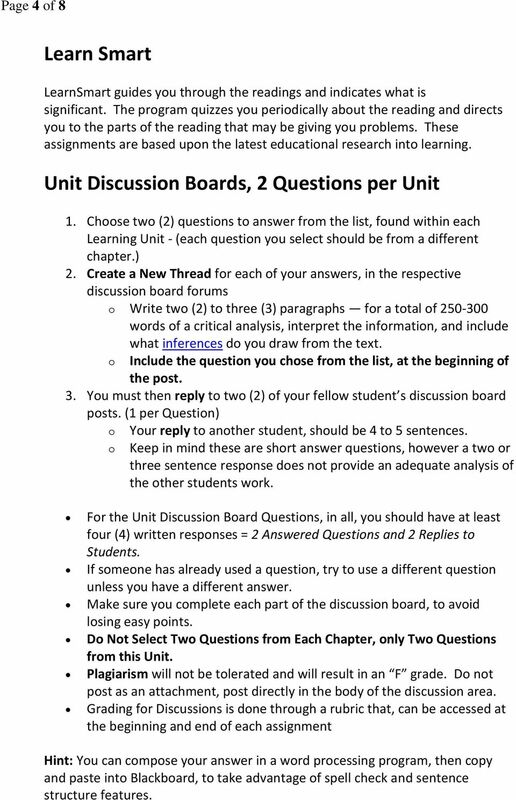 For the Unit Discussion Board Questions, in all, you should have at least four (4) written responses = 2 Answered Questions and 2 Replies to Students. If someone has already used a question, try to use a different question unless you have a different answer. 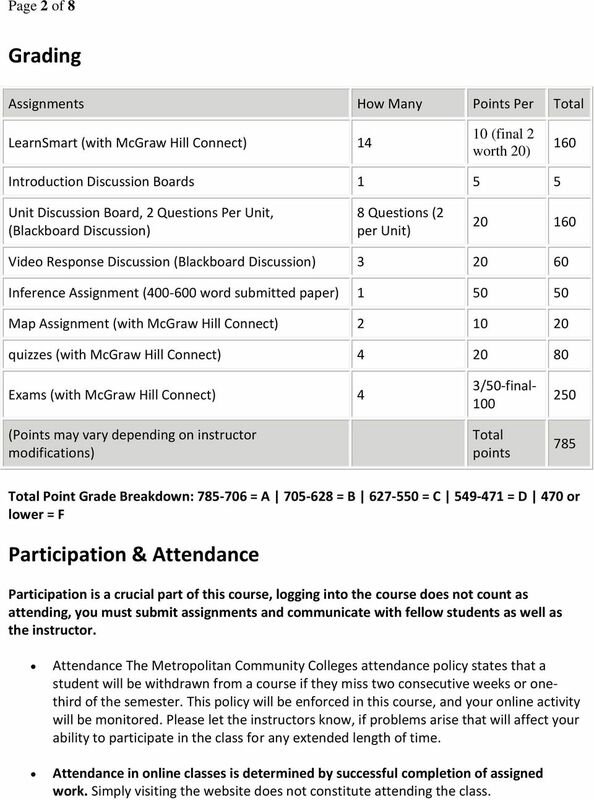 Make sure you complete each part of the discussion board, to avoid losing easy points. Do Not Select Two Questions from Each Chapter, only Two Questions from this Unit. 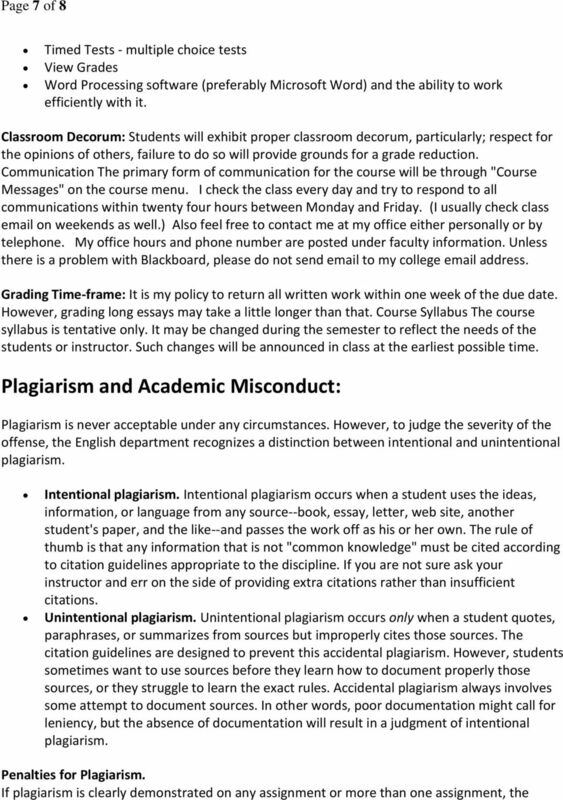 Plagiarism will not be tolerated and will result in an F grade. Do not post as an attachment, post directly in the body of the discussion area. 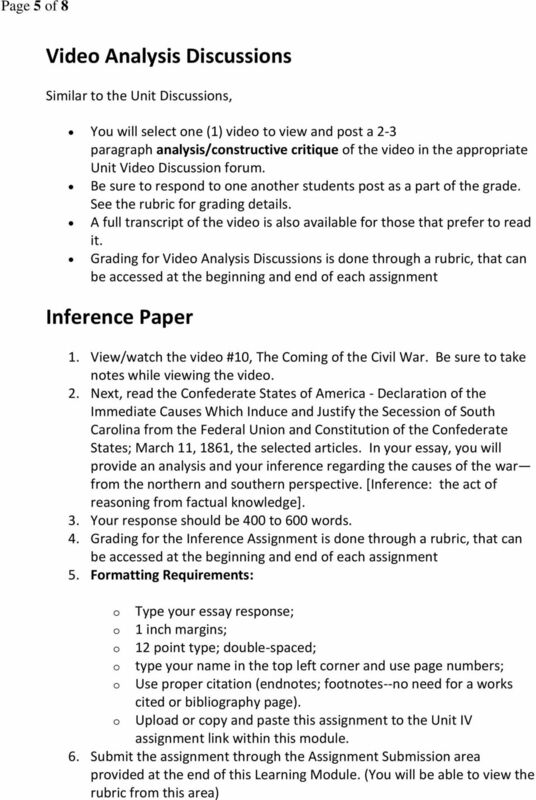 Grading for Discussions is done through a rubric that, can be accessed at the beginning and end of each assignment Hint: You can compose your answer in a word processing program, then copy and paste into Blackboard, to take advantage of spell check and sentence structure features. 8 Page 8 of 8 student may fail the assignment, fail the course, or be subject to even more severe consequences up to and including expulsion from the College. 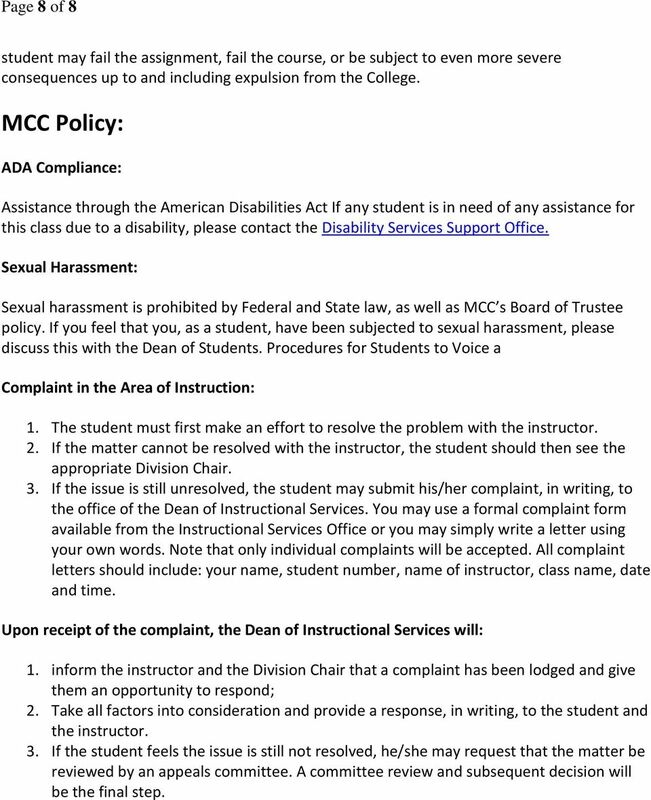 MCC Policy: ADA Compliance: Assistance through the American Disabilities Act If any student is in need of any assistance for this class due to a disability, please contact the Disability Services Support Office. Sexual Harassment: Sexual harassment is prohibited by Federal and State law, as well as MCC s Board of Trustee policy. If you feel that you, as a student, have been subjected to sexual harassment, please discuss this with the Dean of Students. Procedures for Students to Voice a Complaint in the Area of Instruction: 1. The student must first make an effort to resolve the problem with the instructor. 2. If the matter cannot be resolved with the instructor, the student should then see the appropriate Division Chair. 3. If the issue is still unresolved, the student may submit his/her complaint, in writing, to the office of the Dean of Instructional Services. You may use a formal complaint form available from the Instructional Services Office or you may simply write a letter using your own words. Note that only individual complaints will be accepted. All complaint letters should include: your name, student number, name of instructor, class name, date and time. Upon receipt of the complaint, the Dean of Instructional Services will: 1. inform the instructor and the Division Chair that a complaint has been lodged and give them an opportunity to respond; 2. Take all factors into consideration and provide a response, in writing, to the student and the instructor. 3. If the student feels the issue is still not resolved, he/she may request that the matter be reviewed by an appeals committee. A committee review and subsequent decision will be the final step. TEXT: DeVito, Joseph A. The Interpersonal Communication Book. Boston: Allyn and Bacon, 2009, 12th ed. Print.